There’s 2 versions: 1, if you want to write your answers into the form. That the one to the right. Just click on the image – instant download. 2, if you want to type your answers into the online form, it is directly below this copy. Just start typing. After you’ve filled it out, just click the “SUBMIT” button at the bottom of the form after you have signed it. You’re done! Are there any items on these plans (other than the landscaping) for which you are requesting approval at this time” (i.e. walls, patios, etc.)? •	The Architectural Review Committee has 30 days from the receipt of a submittal to respond in writing of their decision. •	All contractors must follow the “General Rules for all Avila Contractors & Service Personnel” listed in Appendix 5 of the Avila Property Owner’s Architectural Review Guidelines. 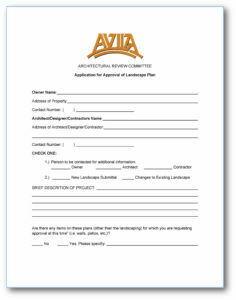 •	Two complete sets of the landscape plan must be filed with this application. •	The ARC is permitted to walk on homeowner’s property for the sole purpose of reviewing the ARC submittal. Attach the plans to your file. The maximum file size is set to 50MB. It is the responsibility of the property owner and the property owner's contractors to review and follow the ARC Guidelines, submit complete and accurate plans and specifications for approval. Variances from these Design Guidelines or from prior submitted plans and specifications must be noted with each request for approval. Approvals given with respect to requests for approval of stated particular design features are limited to the stated design feature.